Please support the Center. Your donations are important to keeping this program going and bringing you more resources in the future. 2-3-18 Today will be much like yesterday with temperatures within a degree or two and tomorrow will be much like the next day and so on. Skies will be mostly clear with light to moderate Northeast to Easterly winds. ••• The previous forecast discussion ••• A high pressure ridge will be sitting on top of So Cal maintaining warm dry conditions with temps hanging above seasonal averages through the middle of next week. ​Hint: for historical weather forecast data use our facebook page as all posts are there on a running timeline. For more details check each areas forecast and weather stations for most current information. This summary applies to backcountry areas only. The snow is quickly diminishing and the locations where you are able to get any substantial snow are very few and generally remote. Expect variable conditions from firm slide for life conditions in the morning and in sheltered areas to soft and unsupportable saturated snow due to the overall warm weather. A slip on firm snow surfaces or a wet loose release due to saturated snow will both lead to sliding down slope on thin snow coverage with numerous obstacles that may cause injury or could prove to be fatal. Be aware of whats below you and the changing conditions of any substantial snow you are on. This will be our last post for this season. For the remainder of the season Variable conditions will continue throughout the mountains at this time of year. Be prepared for quickly changing conditions as you travel and constantly reassess the conditions around you. Be sure you are properly equipped and aware of the changing conditions to prevent getting into a location you can’t retreat from. Our mountain weather will continue to be updated regularly and if your not familiar with it there is a climbing weather page on the site for point forecasts to all the local and surrounding crags. Please continue to visit the center and watch for upcoming events. There will be something happening mid summer. Don’t miss it! It has been a phenomenal season for So Cal and we would like to thank everyone for their participation in our program and events this season. 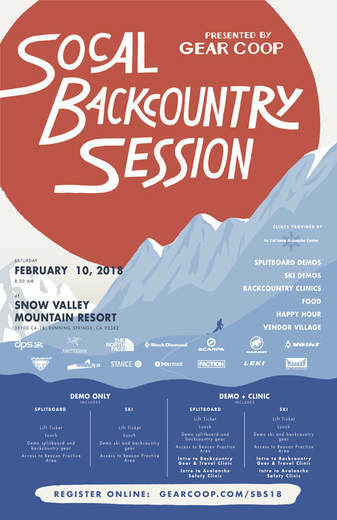 We would also like to thank the National Ski Patrol, The San Jacinto State Park Rangers, The SCSAC board of directors, Snow Valley, Mountain High, Mt Baldy, Sand Diego and Oxnard NOAA offices and all of our fantastic sponsors for their incredible support and help. We are closing down the season after we have issued 24 snowpack summaries, had over 60 students in avalanche level 1 courses, 5 in avalanche level 2 courses and over 400 people in our Avalanche Awareness courses. In closing we still need to raise enough funds to get our first high elevation weather station in place for Southern California. If everyone that used our various forms of information was to donate $10 we would have more than adequate funds to make this happen. For everyone that donates $30 we will put you into a drawing for an Avalanche Level 1 course for the 2017/ 2018 season. All $30 donations received by June 16 will be entered and the winner will be announced on June 19. Thanks again to everyone for making this a fantastic season. As noted above our mountain specific weather information and climbing crag weather page will be useful all year long so please continue to use this resource and happy wanderings this summer. Variable conditions will continue throughout the mountains at this time of year. Be prepared for quickly changing conditions as you travel and constantly reassess the conditions around you. Be sure you are properly equipped and aware of the changing conditions to prevent getting into a location you can’t retreat from. Always practice use of avalanche skills when entering avalanche terrain and on steep slopes. Travel with a partner, use proper safe travel practices and carry a beacon shovel and probe. Most importantly know how to use them! 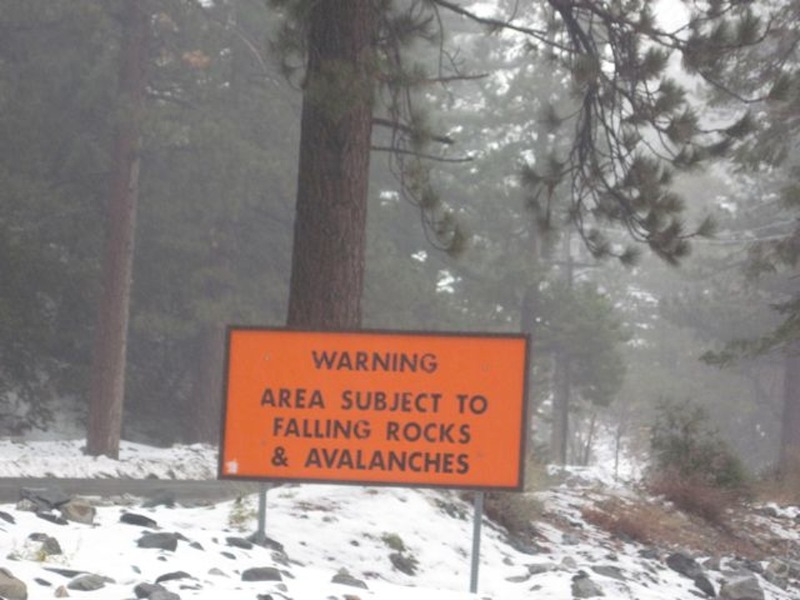 ​Wet Loose avalanches are the release of wet unconsolidated snow or slush. These avalanches typically occur within layers of wet snow near the surface of the snowpack, but they may quickly gouge into lower snowpack layers. Like Loose Dry Avalanches, they start at a point and entrain snow as they move downhill, forming a fan-shaped avalanche. Other names for loose-wet avalanches include point-release avalanches or sluffs. 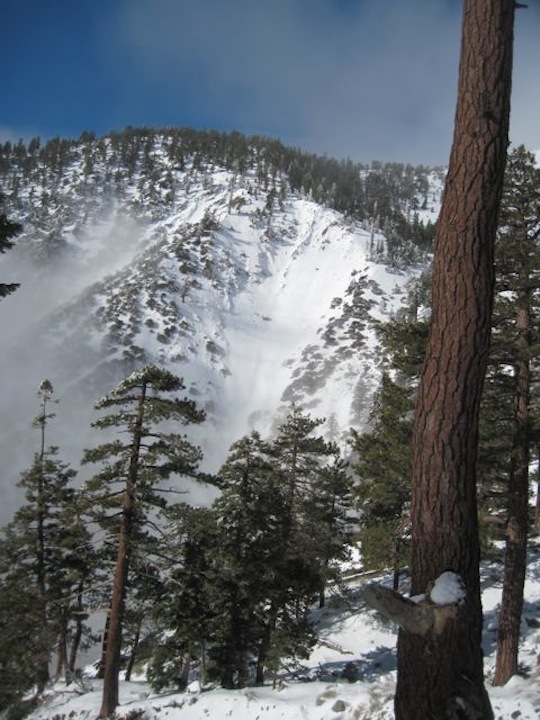 Loose Wet avalanches can trigger slab avalanches that break into deeper snow layers. Location - Dawson Peak, San Gabriel Mtns. Comment - ​Mostly dry trail from Wrightwood to half way up Pine Mtn. Took a few turns on the north eastern slope of Dawson Peak at 1:00. It was sun softened but somewhat lumpy. Road the drainage from the western ride (pictured) @ 2:00. Soft and smooth! The north side of Baldy is looking ripe. Location - Mt Baden Powell, San Gabriel Mtns. Comment - Baden-Powell proved both disappointing and dangerous on several counts this day, some of them our own fault. The mountain still has plenty of northside snow, so it ought to be ripe for descents at least a couple more weeks to come. However the snow is gone from The Snake couloir, reported here a couple weeks ago, and although snow still fills the upper North Couloir, the exit is bad news, as we found. The only good descent is one which I call Avalanche Couloir. Since avalanche danger is close to zero, don't let the name dissuade you, although that could change. I observed an avalanche there in early May one year, triggered by some aggressive skiers in the party ahead of me. It was a healthy sluff-slide--eight inches of fresh snow on top of the winter hardpack. No one hurt, the runout only about 18 inches deep, but potentially dangerous for physical injury. If it gets fresh snow, beware. For this trip, Avalanche Couloir would have been the key to a much better ski descent. Another party on the mountain did it right, ascending the couloir from Angeles Crest Highway so they could find their way back to it through the dense forest above it. The beginning of Avalanche Couloir is easy to find: hike about a half-mile up the highway from the closure point at Vincent Gap. You will round a bend, encountering steep cliffsides most of the way. Keep looking uphill. Avalanche Couloir currently has snow down to about 200 yards above the highway. Up above it you will see a wide, steep snowfield with sparse coverage by young trees, its starting zone. Continue a hundred yards further down ACH and you find the obvious drainage, now a lively creek, of Baden-Powell's main North Couloir. Both of these north-facing features are visible from Antelope Valley. If you come that way, study them on your way in. I suggest avoiding North Couloir at all costs. It took some real rockclimbing skills--in ski boots on crumbly rock--to get through the exit and its waterfalls without slipping. We were glad we started early enough to get out before dark. We had ascended the regular hiking route from Vincent Gap. No snow coverage for the first half mile of trail and then rather difficult conditions thereafter. I found the snowpack disappointingly hard--could not kick deep enough for good support on my tele boots and wound up edging most of it. It was well after 12 pm when the snow became more penetrable. We both employed whippets on one of our ski poles and made use of them several times. Due to difficulties in the ascent, which admittedly included experimenting with some equipment options, we did not go as far as the summit ridge. We started our descent shortly before 2 pm a bit below the summit ridge, intending to find Avalanche Couloir, staying just east of North Couloir but eventually being tempted down into it. It apparently had plenty of snow, but that changed abruptly after a short bit of pleasant skiing. After we finally got out of this little nightmare and started down ACH we looked up at Avalanche Couloir, a mere hundred yards east of the North Couloir exit. We felt like kicking ourselves--what a pleasant ski run that might have been! Location - Kratka Ridge, San Gabriel Mtns. Comment - I swear there's a weatherman conspiracy. WM says 1"-6" Wed., low of 39° F, Thurs cloudy morning w/ chance of snow showers which break at 11:00, and hig of 41° F. Nearly the exact opposite was true. Temp near (slightly below) freezing at 10:00 and cloudless. Snow was rock hard. I saw my brother Rime on on the snow surface and in the trees. Sure glad i tuned my edges last night b/c the first skin up was sooper (d)icey! By 10:45 the far west of the bowl (ENE aspect) was really in form. Hero snow. By 11:30, not much had changed. I did the same run. At noon, the clouds started to roll in (and warm up the snow), but they went away. By 12:15, lift line (N aspect) was super in form. I managed to catch the "Log Chute" at 1:15. The far west (slalom course?) was burnt out. Most flat places were burnt out. It won't last here much longer. FWIW, there was trace snow below Cloudburst Summit. There are still a few possible lines on Avy Canyon (if your are willing to hike the bottom 1/4 of the run. There is one run down lookers right of Robin's @Waterman ("The Face"). Chair 3 still looks in form if you're willing to hike on dirt to get to it. Very soon I won't even bring my skins to Kratka. There is a gap in the fire road which got noticeably bigger in the four hours I was there; i.e. it will be a boot-up zone from here on out. Comment - Great corn snow conditions below 11000 ft at 2pm. Above 11000 ft never softened sufficiently. Location - Telegraph Peak, San Gabriel Mtns. Comment - NW to W aspects icy and firm with soft areas. Use of crampons for ascent with isolated areas that were soft. Softer snow on due N aspect. Firm areas with solid refreeze only a few centimeters to 10cm down. W/NW aspect softened nicely to nice corn by 2:30 pm. Strong Northerly wind caused a crust to form on due North aspects by early afternoon despite sun exposure. 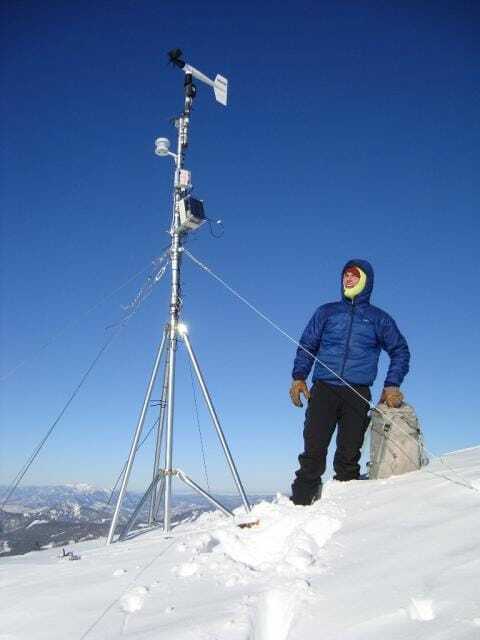 We are raising funds to purchase and install the first of several weather stations at remote locations in our local mountains. This will bring us much needed pertinent data from above snow line that we doe not have reliable resources for. Satelite link up will bring us snow depth and amounts, along with wind, temperature and much more and will be available to the public. Our goal is to raise $10,000 to purchase the equipment, cover installations costs and provide for a much needed overhaul of the website. You should always use safe terrain management and carry avalanche rescue equipment in the backcountry. Most avalanches are triggered by someone in the party or the victim. Practice with your rescue gear often and be prepared should the worst happen. 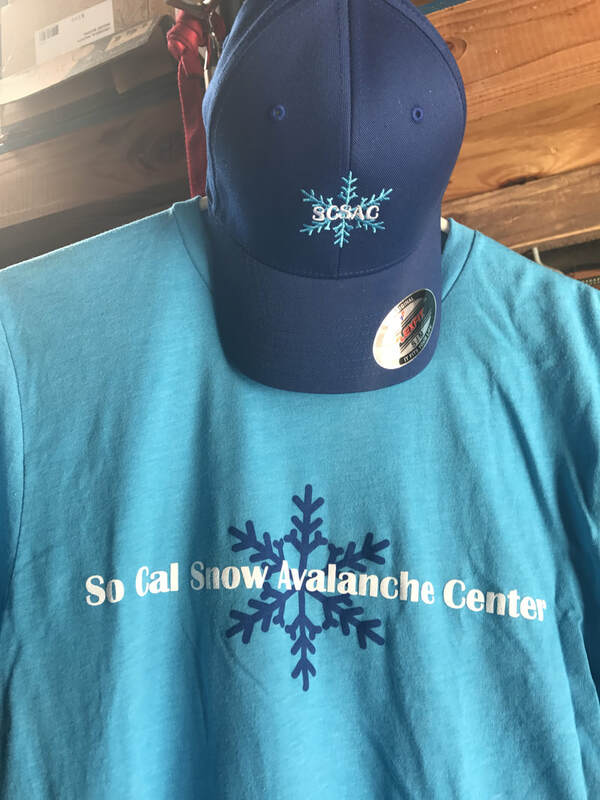 Though we do not have an avalanche forecast center in this area as of yet, the information posted and shared here as well as the resources available on this site will help to make informed decisions for your backcountry travels. Use avalanche forecasts in your travels wherever available and be aware that avalanche ratings are general information. Elevation, location, geographic variability’s, slope aspect and angle all have effects on the particular area you travel in. This is only one piece of the information you should use in your decision making process. There is no substitute for avalanche education, for more resources and information as well as education please refer to our resources page.